Meet Wallis... This very cheeky Shetland Pony is one of my most recent Pet Portrait commission and he's certainly full of character! Back in February this year I attended the Milborn St Andrew Point to Point, it was a brilliant day albeit it slightly chilly but there was some amazing local artists, crafters and producers, I got to meet some great people and this is where Wallis's Mum Kim saw my work. Kim then checked out my Facebook page where she saw some of my recent paintings such as Nancy the duck and the three Alpacas Kevin, Trevor and Norman, my fun yet realistic style was ideal to capture the cheeky character of Kim's gorgeous Shetland Pony Wallis. As Kim lives not too far from me I decided it would be best if I went along to meet Wallis to really get a feel for his personality and take a few pics so I drove over to Milborn St Andrew on a rare sunny morning equipped with my camera and Wellies. After driving down a few country lanes and past some muddy fields I knew I had to be in the right place! 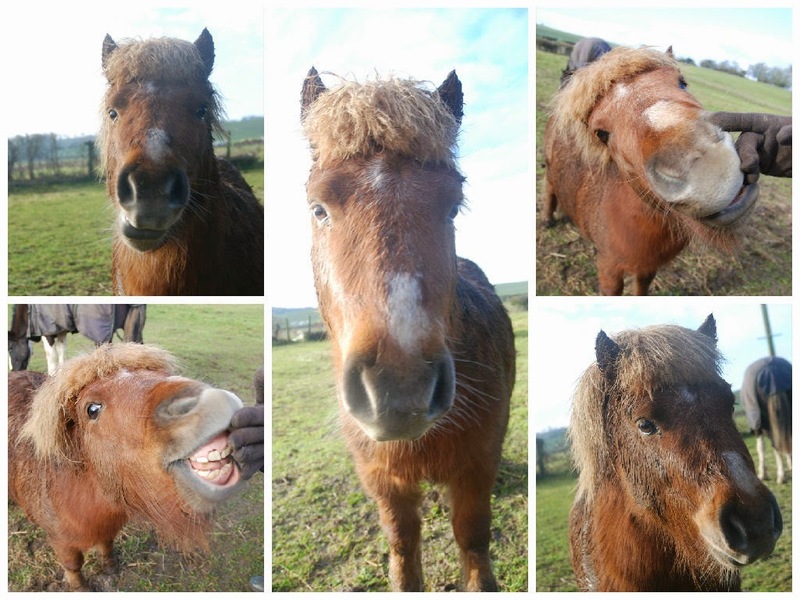 He was instantly curious and came straight over to say hello and after nibbling on my coat and attempting to lick the camera I managed to get some good shots, obviously as he was such a great model we had to give him a few treats, I just loved the shots of him chomping his treats! Kim bought Wallis to keep her other horse company although he didn't let his friend get a peek in front of the camera, I have a feeling he was enjoying all the attention! After about half an hour with him I felt I had got a good glimpse in to his cheeky personality and was beginning to feel he had had enough of posing for me! I shared the pictures on my Facebook page so that Kim could see some of the shots and decide which ones captured him the best. Before I came over to meet him, Wallis had recently had a bit of a hair cut and as he doesn't usually look this neat and tidy I made sure to 'scruff' him up a bit when I was painting his fringe so that the painting really resembled how Wallis would normally look, throughout the painting I kept Kim updated on the progress as it gives us both the opportunity to make sure it's just right. I've painted a few horses over the years but this is the first time I've done a Shetland Pony, I think because of their characters and unique personalities they really fit my style of painting well so I'm hoping this wont be my last! It's always great to meet peoples pets before I start painting them as it does give me a good chance to get to know their personalities which I then try and reflect in the painting, plus it gives me a good excuse to get out and about and play with some adorable animals! However it's not always essential, some people may live too far away or in some cases the pet may unfortunately not be with us anymore but as long as there is a good selection of photographs to work from I will still do everything I can to get their individual characteristics portrayed in the painting. If you are thinking of getting your pet painted or want to get one done as a gift for someone else then just get in touch and I can chat through the different options to see what would work best for your Pet Portrait. I've painted all sorts of pets over the years whether its the family fish, your pet pooch or a cheeky horse there's nothing too big or too small and I'm always looking for a new challenge. I exhibit my work throughout the year and there's nothing better than seeing the paintings in real life, so if you find yourself at a lose end and want to get out in to the Country side then check out my events page to see where I'll be over the year.